Finally, the studio is mostly done and I’ve spent about 5 hours actually making work. Here are a couple more pictures. Note the absence of giant piles of stuff. Also, the pegboard (I love pegboard) and the brilliant solution to my “I could use another table and where do I put this cart” problem. The top is removable. 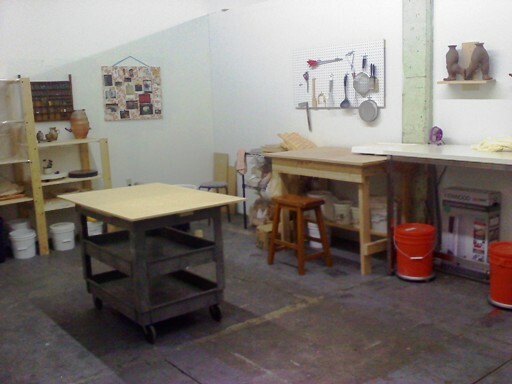 Seems like so long ago that I was moving into Thurman Street Studios. I’m sad to be moving out, but the new studio is so big and so close to home that I know it’s the right decision. The new studio is in Cathedral Park Place (next to the St Johns Bridge). 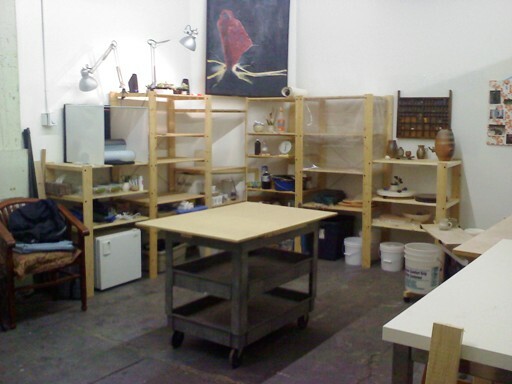 We’re having an open studio event on Saturday, December 3. I’m excited to show off the new space, and to meet my new neighbors. But for those of you who have been asking for pictures right away, here are a few. I’m still getting everything re-organized and put away–more pictures when it’s done! Forgive the poor photo quality–my phone’s camera is not the best. 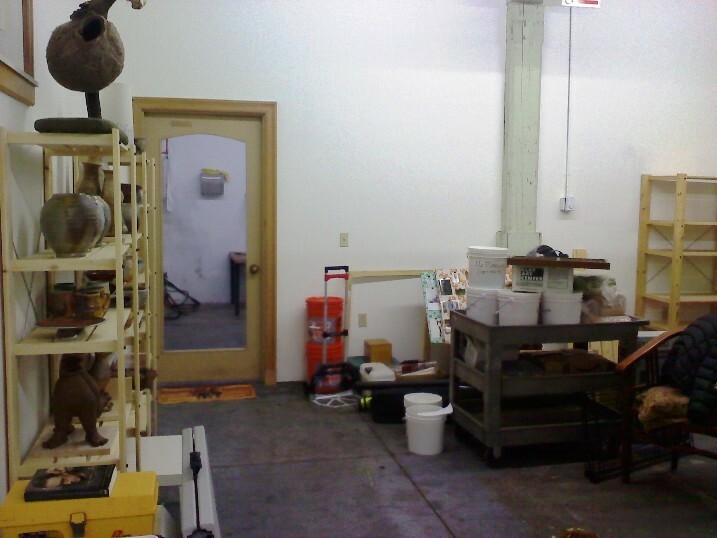 The front door — you can see the finished-work shelves to the left and the big pile of stuff to the right! 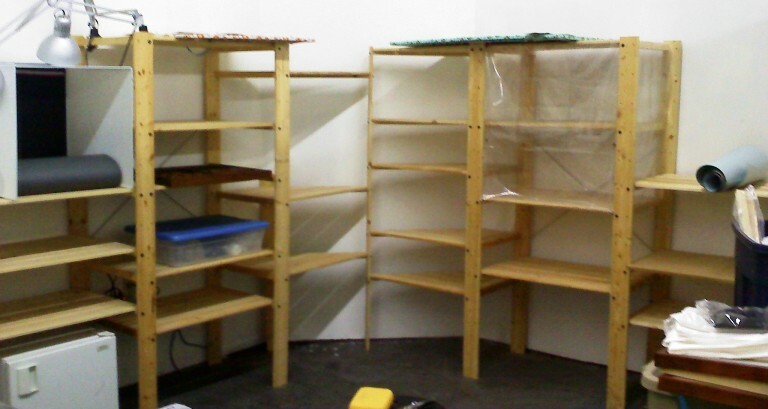 The finished-work shelves from the front. You probably recognize a few pieces from my last show, but most of these pots are from my last firing at Hiroshi Ogawa’s kiln in Elkton. 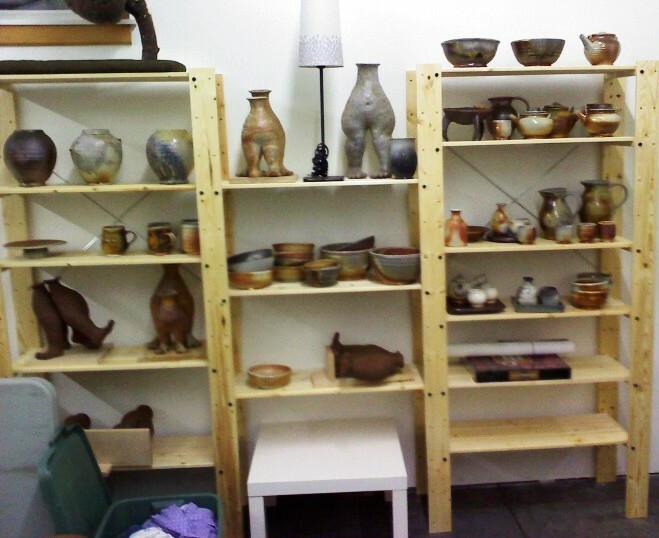 My pots-in-progress shelves. And, to the left, my photo setup. I have room to have it up all the time — that means more photos of new work! Wheel, work bench and utility cart. These are on the wall opposite the photo setup. Still piles of boxes everywhere, but at least the big furniture is approximately where I want it to be. Comments Off on New Studio! I told you back in December 2009 that I wanted to talk about this, but it’s taken me almost 2 years to get around to it. Sorry about that! I’m very process oriented. I make pottery, sew, paint, make books, build things out of wood and metal, cook, etc. for the joy it brings me in the moment of creation. Yes, there is a great satisfaction that comes from completing a really amazing piece, but for me the satisfaction comes from knowing I created it, not from having it on the shelf. I think that’s why I’ve settled on clay (for now) as my primary meduim. Clay is amazingly, literally, hands-on. At least the way I work. Whether my pieces are wheel-thrown or hand-built, I use my hands more than any other tool, and you can see where my fingers touched each piece. Artists are people who create artwork, right? But what does it mean to create art? There are two components to making a piece of art (or a cake or a building): conceptualization and construction. If an architect designs a building and a construction team builds the building, we give the architect creative credit for the building, no question. But if a violinist plays a brilliant rendition of Bartók’s Violin Concerto, who gets creative credit? We might divy it up between the composer and the violinist? What about visual artists who conceptualize their pieces but don’t actually do the physical work of creating them? Chihuly, for example, does something like this, and a bunch of really skilled craftsmen turn it into something like this. The same can be said for Jerram and his glass microbiology (I talked about him in that post two years ago). As far as I can tell, he has never actually made anything out of glass–he just tells the glass-artists what he wants and they make it for him. But you’ll notice on his website that the glass blowers are named, which seems right to me. Ai Weiwei is a Chinese artist who works in a wide variety of media, particularly installations, political and cultural commentary, and architectural works. An entire village made 100 million sunflower seeds out of porcelain for his installation at the Tate Modern. Slip-cast and hand painted. A small pile of seeds was displayed here in Portland, and the Museum of Contemporary Craft. They are perfect little sunflower seeds down to the pattern of black and white stripes (video here). Obviously, sculptors who make huge metal and stone sculptures don’t do all that work themselves. Mark di Suvero makes huge, brightly painted I-beam sculptures (there were two at my college). It would be impossible for one person to make something at that scale without help. So why am I listing all these artists? Why does it matter to me whether artists have a physical hand in the creation of their artwork? In my gut, I feel like they are less responsible for the piece of art than if they had made it with their own hands. As I’ve explained, for me the act of creating the work is inseparable from the work itself. The marks my fingers leave in the clay are part of what the piece is about. The act of building a sculpture transforms the sculpture into something different from the piece I may have initially envisioned. Maybe it’s dependent on the medium? 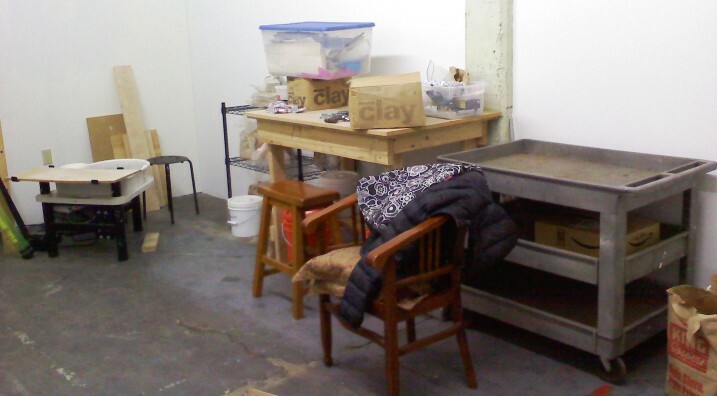 Work in clay is inextricably tied to the process of creating the work. Painting, likewise, is a process of physically adding layers of color to a surface. The directionality of each stroke determines the effectiveness of the finished painting, so it’s not something you can just have someone else do for you. Giant welded steel beams are more conceptual. The mark of the maker is less present, or perhaps not physically manifested in the piece at all. I don’t have a conclusion–this is just a train of thought that I’ve been pursuing for the last few years. I’d love to hear feedback from those of you who consider yourselves artists, and those who don’t. I’d especially like to hear from you if you are an artist who outsources production — do you feel the same about the pieces you outsource as the pieces you make with your own hands? My grandfather died almost a year ago. It’s been a hard year, good and bad, but I’ve been busy and it’s gone by quickly. It’s been a year since I started this post — I promised to post some thoughts regarding my grandfather and other connected things, pottery-related and not, that I’ve been thinking about for a really long time. My Grandpa Fred worked for an aerospace company. He could build anything in his garage (and he did). He taught me how to weld and how to use a metal-lathe. He built a stern-wheeler out of blocks of balsa wood and metal. If he needed a certain tool to do a job, but didn’t have quite the right thing, he would build it himself. I wish I had been older when he was younger, or that I had been more interested in hanging out with him in the garage. But I’m grateful for the things my grandfather gave me — good spacial-visualization, confidence in my ability to make things with my hands, the ability to figure out how to do things without being shown. Of course with those things came stubbornness and the belief that I’m probably right even if I have no idea what I’m talking about. My grandfather made and fixed things, constantly. He got satisfaction from solving problems and working with his hands. I get that same satisfaction, but my life is dramatically different from his — I have fewer opportunities to make and fix. Pottery fills some of that need, but not all. For the past year or so I’ve been aching to spend more time building, cooking, sewing and growing and less time typing and clicking. Problem is, between the day job and the studio, there just isn’t enough time in the day. Brandon Phillips quoted Matthew Crawford about this time last year, and I’m glad he did because Crawford’s book, Shopclass as Soulcraft, played right into some ideas I’d been turning over in my head for years. Crawford quit a cubical job to be a motorcycle mechanic because he decided he’d rather spend his days actually doing something, rather than typing and clicking. Industrialization has changed our relationship with the daily grind. Back in the day, people spent their days working to directly produce the things that we now buy at the store. So for most of us, our work days consist of re-arranging bytes with the end goal of making money for a big company, or moving along the bureaucratic process of the government, or something otherwise unrelated to our actual lives. We spend all day in front of a computer, collect our paychecks, go to the gym, buy stuff from the store, live in condos, eat at restaurants. I’m not judging–I do these things myself. I’m not a full-time potter growing my own food. While that sounds lovely, I have no other means of financial support, and I choose the stability of a day-job over an idyllic pastoral existence. We do all these things because that’s how we achieve some sort of middle-class American life, and for the most part it’s fine. If you’ve read more than one entry in this blog, or know me at all, you know that I didn’t just do my first woodfire. But in a way I did. I called the shots for the first time instead of just doing what I was told. Carol and I (finally!) rented MHCC’s Little Woody kiln, and fired it for about 15 hours. Little Woody is a small, downdraft wood kiln. It held about…40 cubic feet (?) of work, and regularly fires easily in 12 hours. We took a few extra hours because we had the time and the wood, and didn’t really know what we were doing. So…the firing actually went pretty well, but I didn’t realize it at the time. We got cone 11 down and 12 soft all around. Our cone packs were almost identical front to back, and pretty close top to bottom. We candled with gas overnight (felt a bit like cheating, but that’s how they do it there), and started with wood at 5:30 am. Once we started stoking, we let the kiln take off and gained 300-400 degrees F per hour until we got cone 010 down, did some body reduction, and kept cranking. Around noon we had our first mishap. Four bricks from the bag wall and into the fire box (the bag wall is a brick screen separating the fire box from the pots, which helps direct the flame up and over instead of letting it short-cut through to the chimney). We were lucky that they fell away from the pots. We didn’t know whether we had inadvertently caused damage to the kiln, and weren’t sure how the large hole in the bag wall would affect our firing, so the fall really put a damper on our moods. All was well for the next hour or two, and we still felt like we were gaining temperature well. We had pyrometers at the top and bottom of the ware chamber, and for the first several hours the temperature at the top and bottom was within 50 or so degrees. After the bag wall fell, the gap widened, and the variation in the bottom temperature with each stoke became more pronounced. Suspecting that this had to do with the gaping hole, I suggested that we stop looking at the bottom pyrometer, and judge the temperature variation by the comes, which were falling within about a half-hour of each other, indicating that the kiln was fairly even. We continued to increase in temperature, though less steadily and with more effort until we reached about 2200 degrees F.
We had planned to stop firing at about 6:30. We were supposed to be off campus by 7pm, and had left ourselves plenty of time. But around 5pm, the kiln stalled out. We were stuck at 2200 and unable to get any hotter. We opened this and closed that, increased the size of our stokes, decreased the size… tried everything we could to get the temperature to raise. Cone 10 was down and 11 was slightly soft, so we knew we had gotten up to temperature for a while at least. My main concern was whether we could end at a hot enough temperature to avoid crusty unmelted ash on the pots. Cone 11 had been slightly soft for hours, and the fact that it wasn’t moving any farther made me think we’d cooled off too much. I was determined not to stop firing until I got it to move even a hair more. We hit 2300 (according to the pyro), but I couldn’t hold it for more than a stoke. Around 8pm I decided the next stoke would be the last, no matter what, but I over did it and the temperature plunged. Finally, at 9pm, after holding around 2250-2290 for about two hours, we called it a night and closed up the kiln even though cone 11 on the top never moved beyond slightly soft. Two days later we opened the kiln. I had nightmares the night before about crusty, ashy pots and unusable bowls. Much to my surprise, the pots were perfectly smooth. That stubborn top cone 11 had melted into a perfect arch and 12 even softened slightly. The ash was amazing–some lovely green drips. 1) More body reduction! We both knew we needed to do a body reduction at cone 010, but didn’t know how long it should last. Funny the things you pick up from firings, and the things that slip through the cracks. Our shino glazed pots were white, and the iron-rich clays that should have been dark brown and burgundy were toasty. We got some beautiful colors, but not the richness that we would have had if we’d reduced for longer. 2) Don’t rely on pyrometers. We knew this–everyone says to use them to get an idea of whether your temperature is rising or falling, but not as an absolute number. Everyone says it, but no one does it. 3) Two people can fire a kiln for 15 hours, but it’s a lot of work! We probably could have planned better. One of us could have started the firing at 5:30am, traded off in the late morning, and worked together in the afternoon, once the stoking got more intense. This time we both wanted to be involved all the way through, but next time we could probably arrange shifts for the first half of the day. Or add a third person and take even longer breaks. I think we would have been more successful at the end (had more energy left to experiment) if we hadn’t been so tired.